Most smokers developed the habit in their younger years. Despite the health risks, smell and cost, most people are unable to quit smoking without assistance. The more you repeat a behavior, the harder it is to quit. Consider this. If you have been smoking 2 packs a day, then you have repeated the bad behavior 20 times per day, 365 days per year. From this perspective it is clear why quitting smoking is more difficult than quitting some street drugs like Heroin and Cocaine. Nicotine is out of your system within 3-4 days of quitting, yet you find yourself powerless to quit. The psychological additional to cigarettes is quite powerful. With each passing year, smoking became permanently affixed to your subconscious mind. Smoking has been your coping mechanism to stress, hunger, happiness, etc. Your mind has created a linkage to the pleasurable effects that nicotine produces. Will power is not enough to quit become will power is a function on the logical part of the brain. Hypnosis will address the subconscious part of the brain, which is driving your addiction. It usually takes several hypnosis sessions to quit the habit long term, but the effects of quitting smoking begin within 20 minutes of the last cigarette. Within 10 years of not smoking, the lungs almost completely heal, even after years of smoking. 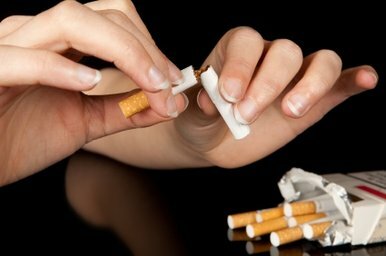 Thousands of clients successfully quit smoking through hypnotherapy each year. The hypnotherapy speaks to the subconscious mind and releases you from the habit and psychological need to smoke.